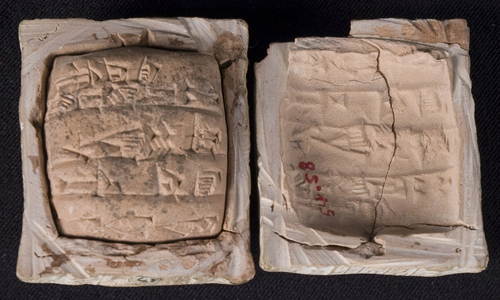 Many tablets were completely covered by a clay envelope onto which their text was recopied and sealed for security. This one records royal gurs (about a bushel) of grain (she). The she sign is a stylized picture of grain. The tablet is dated: "month of the cutting of the grain, year when Ur-bi-lum (a nearby city) was destroyed." This was 2049 BCE, under King Shulgi.